Haruka Kikuchi is a 31-year-old native of Japan who, since relocating in 2014, has been accepted into the New Orleans scene so readily that she has already recorded with everyone from Kermit Ruffins to a Mardi Gras Indian krewe. She plays tailgate trombone in such a natural style that local radio station WWOZ has said she “sounds like she may as well have been born and raised in Treme.” Her skill has made her attractive to a number of bands. In June she played the Edinburgh Jazz Festival with the Shake ‘Em Up Jazz Band and stopped on the return trip to play with Post Modern Jukebox in Ann Arbor. 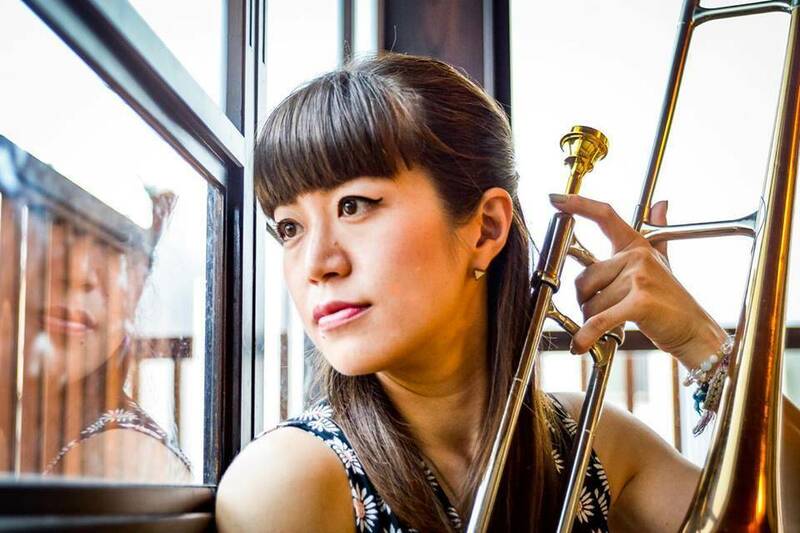 In addition to these travels, and while also making engagements with her own band, Haruki Kikuchi and the Big 4Tune, she has found time to pursue a passion project which hooks the worldwide traditional jazz community back into its source. Since 2016 she has been arranging for visiting Japanese traditional jazz musicians to record two or three tracks with New Orleans residents from the Brass Band and Hot Jazz communities. Her hope is that they take some of the current New Orleans flavor back with them to the clubs in Japan at which she herself got her start. The jazz revival scene in Japan, already strong in the ’50s, solidified around a visit from George Lewis in 1963. The style of play there is consistent enough to be described as its own sound. Meanwhile, the sound of the street in New Orleans has continued to develop, with a large legacy attributable to Danny Barker and the brass bands he fertilized in the 1970s. When these musicians greet each other, even across a language barrier, magic happens. So far she has produced 17 tracks of mostly New Orleans mainstays like “Struttin’ With Some Barbecue” and “Jesus on the Mainline.” Sessions have featured anywhere from three to six musicians, always with Kikuchi herself and at least one visiting Japanese musician. The New Orleans residents joining them have included Gerald French,(who is only the fifth leader of the 108-year-old Original Tuxedo Jazz Band), Richard Moten, Dewon Scott, Larry Scala, Joshua Gouzy, and Molly Reeves. They have been young and old, black and white, male and female, NOLA born or transplant, as diverse as the city itself. The Japanese musicians have themselves varied in age, gender, and instrument but all share a love of New Orleans style jazz. The six groupings each provide something unique, but the overall feel is totally New Orleans—hot contemporary traditional jazz from a city where it never went out of style. The tracks are available for purchase in six separate blocks based on performer groupings. As there is now more than enough for an album I hope they will soon be made available together. Or even better, a record company should collect these gems and give them a full international distribution.